Every nursing journal offers its audience a look into nursing research and current problems facing today’s bedside nurses. The nursing field is one of continual change and nursing journals helps nursing professionals across the globe to review new practices and newfound technological approaches to care. As a critical care nurse, I have seen nurses in a wide variety of specialties find useful information in the top journals I will mention below. If you are looking for relevant research in nursing, check out the peer reviewed nursing articles in the following publications. 1. The American Journal of Nursing (AJN) is an amazing monthly journal with a well-established history. The AJN is peer reviewed and evidence-based. As a graduate student, I use this journal in almost all of my DNP courses. It covers many nursing topics and provides students with the content needed to develop both principles and practices. From politics to meningitis, the AJN provides the nursing community a resource to high-quality information. For example, I was writing a paper about patient ratios and the correlation to nursing burnout. The AJN had various articles on this topic. The articles were published within the last five years, which is a requirement for many schools, and also provided digital object identifier (DOI) information, which is also a common works cited requirement. When I’m writing a paper, AJN is the first place I look. The AJN provides nurses across the world a home for advanced investigation in clinical outcomes. 2. The American Journal of Critical Care (AJCC) is a bimonthly publication from the American Association of Critical-Care Nurses (AACN). I do not receive this journal but have found myself looking at various articles online. I find myself using it so often that I consider purchasing a subscription with each read, because the content is worth it. The AJCC is a must for nursing students who are in school and needing high-quality nursing research articles. The AJCC has clinical studies, case reports, and editorials on all things critical care. I’m a critical care nurse myself and I know how fast protocols and care plans change with evidence-based clinical findings. The AJCC keeps me up-to-date on nursing practices and upcoming technology. For example, the AJCC had an article about communicating while on mechanical ventilation. Through this article, my local ICU floor started a communication initiative for patients on mechanical ventilation. With this article, we were able to assist our patients and provide different means of communication. 3. CriticalCareNurse is a bimonthly publication from the American Association of Critical-Care Nurses (AACN). As a member, I receive this journal through the mail. Each time it arrives, I’m eager to read it because I know the material will expand my knowledge base. The focus of the journal is on high acuity, progressive and critical care populations. Reading this nursing journal not only improves your critical thinking skills, it also expands your knowledge base. For example, I work in the adult intensive care setting. With the content the CriticalCareNurse magazine provides, I’m able to understand how pediatric providers deliver care in certain situations. The CriticalCareNurse journal provides nurse with evidence-based research and newly developed protocols that improve health outcomes. 4. The Journal of Professional Nursing (JPN) is a publication that concentrates on the educational aspects of the nursing profession. The JPN presents articles in nursing education, educational research, and policies related to education. The journal is an absolute essential for nursing educators and nursing administration. Even though I’m a registered nurse now, I haven’t forgotten how difficult it was to be a nursing student. There is currently nursing shortage that can only be solved by assisting individuals to achieve their dreams of becoming nurses. Often, some nursing program approaches towards education can actually hinder an individual’s growth and development. This journal presents proven strategies to create nursing students’ success. For example, a recent article explained ways to promote meaningful reflection during education. Reflection is a concept used in many undergraduate nursing courses and with the help of JPN, professors can find and implement strategies that have been linked to positive educational outcomes. Just because someone is a nurse, doesn’t mean education implementation is simple. The JPN offers professional tools for educational success that are invaluable for any nurse that educates others, and as nurses, that is each and every one of us. 5. The Online Journal of Issues in Nursing (OJIN) is an online journal reaching nurses internationally. It’s a great journal that covers a wide spectrum of nursing topics. The OJIN is a scholarly journal of the American Nurses Association (ANA). I love the online format of this journal. Often, I want to read up on a certain topic, and instead of spending hours looking through journal databases, I simply go to OJIN’s “Journal Topics.” Once I find the topic I’m able to read a variety of articles on the subject I’m researching– it’s that simple. The ANA has a user-friendly layout and provides nurses worldwide with the ability to educate themselves on current nursing topics. I recently read a section titled, Advanced Practice Registered Nurses (APRN) Roles: Opportunities and Challenges for Practice. As a nurse who is in school to get my APRN, it helped me to understand what potential hurdles I could face as a provider. From societal violence to nursing care, the OJIN provides nurses with peer-revised education that can be used in various nursing specialties. 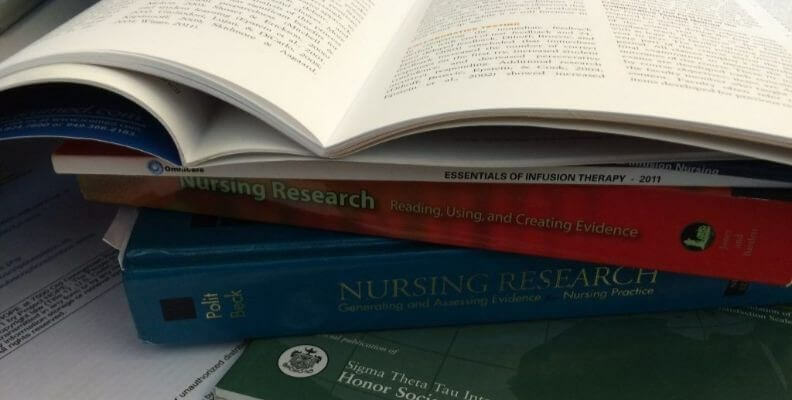 Regardless of the nursing specialty you work in or are studying, these five peer reviewed nursing journals will help you expand your knowledge base and improve your nursing skills. Do you have a particular nursing journal you read and recommend? Comment below and share! I would love to hear from you all. Nurse Nacole is a board certified registered nurse, blogging about advanced nursing education and being a new nurse. On her self entitled blog, Nurse Nacole posts daily nursing tips, along with advice on nursing academics, licensing exams, professionalism and nursing school success. Nacole is currently in school to become a Nurse Practitioner.